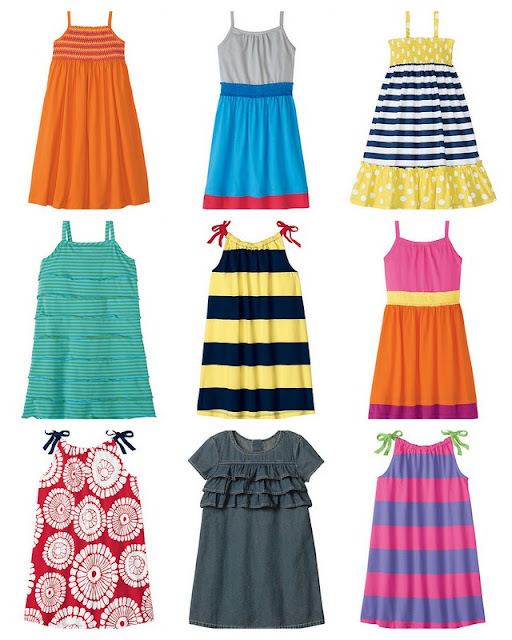 Right now, all summer dresses are marked down to just $19 at Hanna Andersson. They have some really great ones this year... be sure to look at the images where the dress is shown on a model because they look even better when worn by a cute little person. I picked some of my favorites to show you above (keep in mind that some of these started out at $46!). Shipping is not super cheap at Hanna Andersson, so a trip to the store may be a good idea. Plus, if your store does not have the size or color you are looking for, they will order it and have it shipped to you for free. I especially love the yellow and navy striped pillowcase dress on the middle row (very temperature appropriate for our Phoenix summers). You can bet that the fabric will be soft, substantial and will hold up fabulously in the wash. Sale ends on Memorial Day. I just had to tell you that I loved this sale. Hanna Anderson makes the best clothes...they can be worn & worn and washed & washed through many children! I bought some dresses. Thank you, thank --you are truly the BEST! I was at my local Hanna store today (I swear it opened to taunt and tempt me!) and ended up buying two dresses. The sales lady laughed at me because I saw that grey and blue dress (top row of your pics) from across the store and gasped with excitement! It is even more beautiful in person. Love the unexpected combo of colors. And it is almost sold out online! Things are selling out quickly. Hope you got what you wanted!